An incredible report from Babak Taghvaee in the latest issue of Combat Aircraft magazine. According to Taghvaee, the Iranian air force’s fleet of 1970s-vintage F-14 Tomcat fighters have spent the last nine years chasing around mysterious flying, glowing objects over Iran’s nuclear facilities. The Iranians believe the objects are spy drones belonging to the U.S. Central Intelligence Agency, sent to sniff out Tehran’s suspected atomic weapons program. But they attribute to these alleged Unmanned Aerial Vehicles flight characteristics and capabilities far beyond what any known drone can achieve. And just last year one of the alleged flying robots apparently also shot down an F-14 attempting to intercept it. Or at least some Iranians seem to believe so. Honestly, I have no idea what to make of any of this. Except AWESOME. The Shah of Iran ordered 80 F-14s from Grumman in the early 1970s and had received 79 of them by the time of the 1979 Islamic revolution that deposed the Shah and turned Iran from a strong U.S. ally to one of America’s bitterest enemies. The twin-engine, swing-wing F-14s, among the most powerful interceptors in the world, are the flagships of the Iranian air force. The sudden cut-off of U.S. assistance meant hard times for the Tomcat fleet, as did the brutal war with Iraq in the 1980s. But Iranian state industry learned to fix and modify the F-14s, thanks in part to plans and equipment acquired from American sources by Tehran’s spies. In the early 2000s, Iran still operated some 50 Tomcats — and they would soon be the only operational examples left in the world as the U.S. Navy finally replaced its own F-14s with newer jets. Over the decades Tehran has built three major nuclear facilities that could, in theory, be used to assemble atomic weapons: reactors at Bushehr and Arak and an enrichment plant at Natanz. This infrastructure became public knowledge in 2002. No doubt the CIA took a strong interest. “A number of reconnaissance UAVs were sent to collect intelligence to prepare for a possible attack” by Western forces, Taghvaee writes. “In several cases … F-14s faced them but were unable to operate their armament systems properly,” Taghvaee writes. One Tomcat taking off to intercept a luminous object on Jan. 26, 2012 mysteriously exploded, killing both crewmen. Taghvaee implies the alleged UAV was somehow responsible, as the F-14 in question was “one of the fittest” of the 40 or so Tomcats then in service. It should go without saying that the CIA and the Pentagon fly reconnaissance aircraft near—and even over—Iranian nuclear sites. In late 2012 and again this March, Iranian fighters tried to intercept American Predator drones outside Tehran’s airspace. In the March incident, a U.S. Air Force F-22 stealth fighter blocked the intercept with some Top Gun-style theatrics. In 2009, the Air Force copped to the existence of a new, previously secret drone operated in conjunction with the intelligence agency. The RQ-170 Sentinel was based in southern Afghanistan within short flying distance of Iran. In December 2011, a Sentinel crashed on the Afghanistan-Iran border and was captured by Iranian troops. Neither the Predator nor the Sentinel is particularly high-flying nor can hover or glow blue. And neither has the electrical power to scramble radars and navigation gear. Rumors abound that the Air Force and CIA operate a stealthy new drone that has not been disclosed to the public. Even if they do, it’s unlikely that the new UAV is capable of Mach-10 hypersonic flight—the Pentagon is still struggling to reach Mach 5. 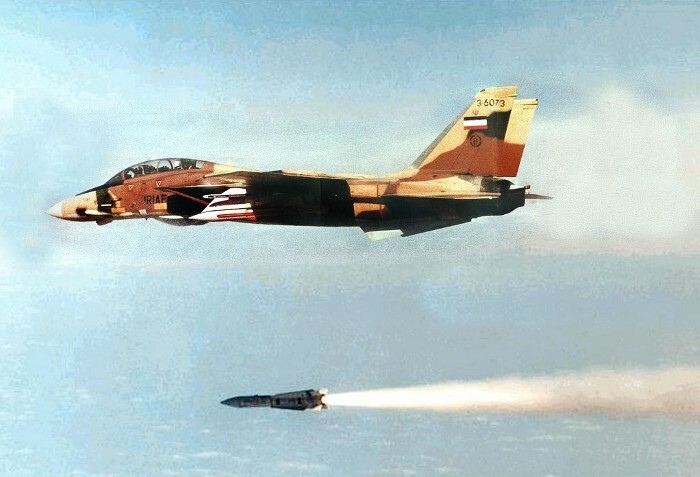 So if Iranian F-14s truly are chasing around super-fast, super-high-flying and lethal UFOs, what exactly are they?